Even after the announcement of 100 per cent electrification of villages by Prime Minister Narendra Modi, residents of Puranagaon under Boisahabi tea estate still cry for electricity. 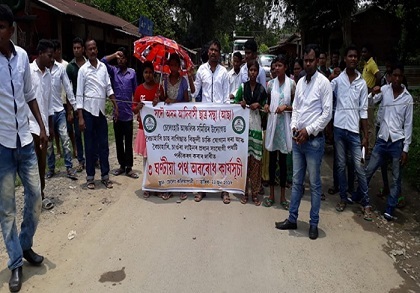 All Adivasi Students’ Association of Assam (AASAA), Selenghat unit on Saturday blocked Dhodar Ali for three hours at Seleng Kaliapani under Mariani constituency in Jorhat district protesting non-electrification of Puranagaon under Boisahabi TE for the last two decades. The AASAA alleged the workers of the Boisahabi TE are deprived of the power connection for a long period. Repeated submission of applications to APDCL, Teok electrical sub division yielded no fruitful results. They also alleged utter negligence of TE authority in this regard. Over the years, the residents of the tea estate have been passing their life under the darkness. Miffed at the apathy of the authorities towards their problem, people of the TE on Saturday came out to the street and expressed their strong resentment against the ASEB authority by blocking Dhodar Ali for three hours. Later the agitators called off their strike following the assurance for fulfilling of their demands by Circle Officer of Teok Revenue Circle. Ritesh Nayak and Sankar Kaya, president and secretary respectively of AASAA, Selenghat unit also threatened to continue their agitation if the authorities concerned fail to provide electrification for the village within a week.